Throughout the last years, the EU has been criticised for many things, and the UK has now been the first to decide on leaving. Still, there are good examples of how the union can benefit even non-member countries. For instance, there is a project called Energy Efficiency – The Premise of a Better Environment in Romania-Serbia Cross-Border Area, which was presented at the Energy Week in Belgrade in mid-June. This joint effort of two cities in the Banat region, Pancevo in Serbia and Resita in Romania, required EUR 1.4 million, mostly financed by the EU as part of the Interreg – IPA CBC Program Romania-Serbia Programme. “We’ll soon install solar collectors for hot water production at our sports facilities,” said Rares Gantolea from Resita. Andjela Vila, who works at the Secretariat for Economy and Economic Development in Pancevo, Serbia, explained that the current aim was to insulate the walls of a fifty-year-old sports hall and install a new heating and cooling system. “But as a next step, we intend to put solar panels on the roof of the city’s swimming pool,” she added. In Pancevo, the current project is viewed as a follow-up to a much bigger and very successful one which ended just last year and had the city partner with the Romanian Lugoj municipality: Banat sun 4 all, also funded by the EU’s IPA cross-border cooperation. 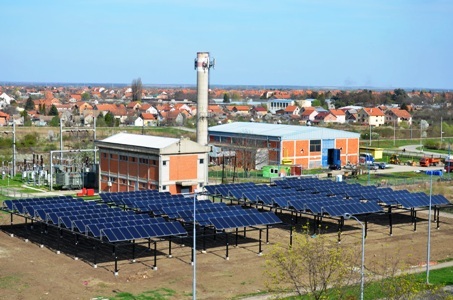 As a pilot, its aim was to promote solar thermal use by setting up a field of 360 solar collectors for the municipality’s district heating business, Toplana Pancevo, while Lugoj had solar collectors installed on four nurseries, a sports hall, a soup kitchen and a residential home. “As far as we know, our solar district heating plant is the biggest one in the region,” said Vila. In fact, some people call it “the biggest solar thermal project in Serbia’s history”, and it is most probably the only SDH installation in the country. Together with the Kotež power plant, it provides around 2,200 citizens of Pancevo with hot water each day. The collector field components were delivered by German manufacturer Viessmann, whereas the system was set up by Jedinstvo Sevojno, a Serbian-based heating specialist. The field was mounted on a three-metre steel structure to utilise ground space (see the photo above). “We estimate the plant to produce 664 kWh/m² annually,” said Zoran Božanić, Technical Manager at district heating company JKP Grejanje. The comparatively high yield is achieved by using solar energy in two ways, depending on the season. In summer, the solar field provides consumers with hot water; in winter, it preheats ambient air from around 5 to 15 °C, so that the air can be used during natural gas combustion in two boilers of 23.3 MW each. Simulations had shown hot water production to contribute 71 % to the annual yield, whereas preheating would be expected to add the other 29 %, said Božanić. At the final Banat sun 4 all conference in December 2016, the deputy mayor of Pancevo, Saša Pavlov, emphasised the importance of effective energy use and energy efficiency measures for sustainable development based on international standards. “Pancevo is continuously striving to cherish and protect the environment, and we are grateful that this project has allowed us to modernise and enhance our heating network. We consider energy efficiency and renewable use to be of strategic priority and are making significant progress in this field,” he said and promised further action, a promise which has now been fulfilled by the launch of the cross-border project with Resita.